Service to the family of the deceased is the number one priority for Lyerly Funeral Home. We tailor services to meet each family's specific needs. Lyerly Funeral Home, Inc. offers a full range of services at time of need, including traditional church or chapel services, graveside, memorialization, ship-in, ship-out, cremation options, as well as assistance with pre-arranged funerals and insurance needs. Full Service Funerals- service with visitation the night before or day of service. The ceremony is held at a church or our chapel followed by burial in a cemetery. Families may select any or all of these services. Coordination with clergy, musicians, and cemetery. 6. Personalization - families may wish to personalize the service or setting for their loved one. We offer custom insert panels for the casket, such as American Flag and praying hands. We have a magnetic picture board on which loose photos may be displayed. Some families may wish to display special mementoes of the deceased, such as hats, trophies, etc. Cremation following traditional service - Service as listed above with body cremated after service. Refer to Cremation Page for more information. Cremation with memorial service - Chapel or church service is held without the body of the deceased being present. Refer to Cremation Page for more information. Ship in services - Body is transferred to us from another city. Ship out services - Body is transferred from us to another city for final disposition/burial. 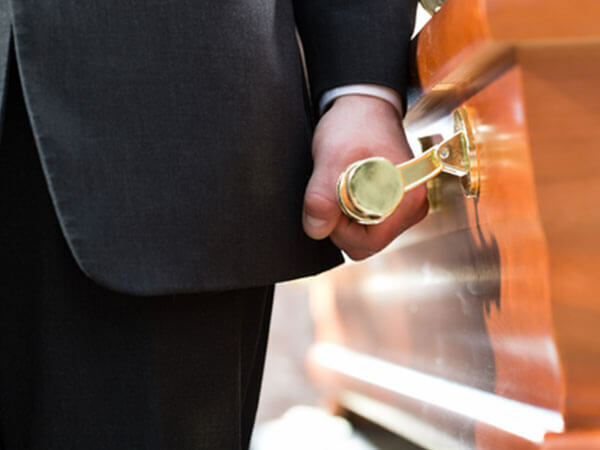 Pre-arranged funerals - We can assist with gathering information, selecting funeral options, as well as financial arrangements in advance of need. Caskets - We offer a wide selection of styles and price range of metal, stainless steel, hardwood, copper, and bronze caskets. Family may make its selection in the privacy of our selection room. A sampling of these caskets is pictured on the Products Page. Outer burial containers (vaults) - These containers are designed to protect the contents, including casket and body, and most cemeteries require some form of outer container. We offer a wide selection of these containers to fit each family-s needs. A sampling of vaults is pictured on the Products Page. Cremation containers - These containers may include a casket, a cremation memorial urn, a cremation vault, or a memento urn. Since final disposition and type of service desired are considerations in this decision, the funeral director can assist you in determining which container might be most appropriate. Some families prefer to purchase a regular casket. We also offer a rental casket. Cremation memorial urns are a permanent container for the cremated remains. We offer a wide selection of styles and prices. Flag cases - We provide cherry and oak cases to protect and display flags.